Wish you all a happy Krishna Janmashtami. I worship the Lakshmi of the cowherd clan in child form, Who is shining with ornaments that send out the waves of beauty, Who is wearing the peacock feather as a decoration and Whose glances are a stream of mercy. Here Leelasuka describes KrishNa as GopAlasundari or as the Sree of yadAvAs. KrishNa is the Lakshmi of cowherd clan and hence the feminine gender is used. Her ornaments, angabhUshaNam, send out waves of beauty, lAvaNyaveecee, because they themselves are made beautiful by the beauty of KrishNa. Swamy Desika says in his Yadavabyudaya, 'angai: amitasaundaryai: anukampita bhUshaNam'. The Lord appeared in front of the devAs, who prayed to Him to destroy the evil forces, to assure them that He will take KrishNaavatAra. There Swamy Desika describes the beauty of the Lord saying that His ornaments were only a reflection of His limbs which were of immeasurable beauty. 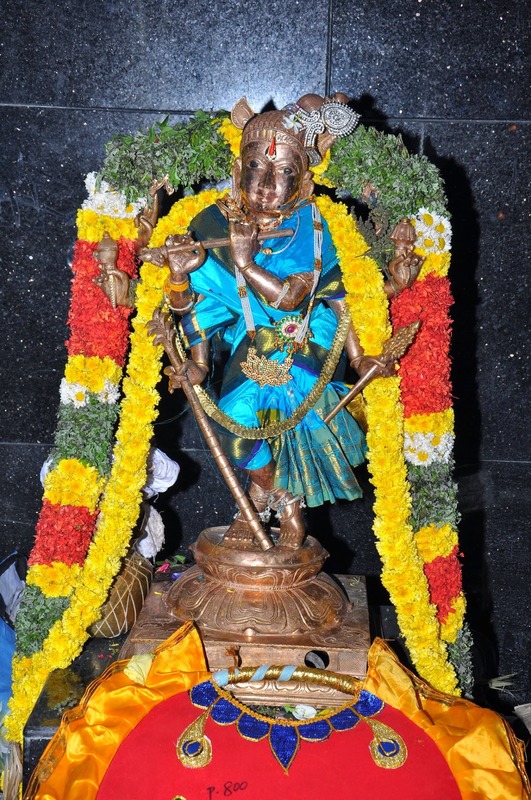 kuntalabharAm, Who is showered with the forest flowers, vanya prasUnokshitAm, Whose tilaka on the forehead is made of the red stone from the mountains, Saileyadrava kluptacitra tilakAm, Who is always attractive, Saasvat mano hAriNeem, Who is enjoying the music from the flute leelA veNuravAmrtaika rasikAm, and Who is the glory of beauty personified, lAvaNya lakshmeemayeem, of young years, and has a body dark like tender tamAla flowers, bAlAm bAlatamAla neelavapushAm. May Lord Krishna bless us all with his grace to read at least one verse of what he told to arjuna every day.